Boxie Loyd had just sat down with his brother when he received a call from a neighbor down the road. Fortunately, the dramatic breaching of Staunton Dam turned out to be just hearsay. 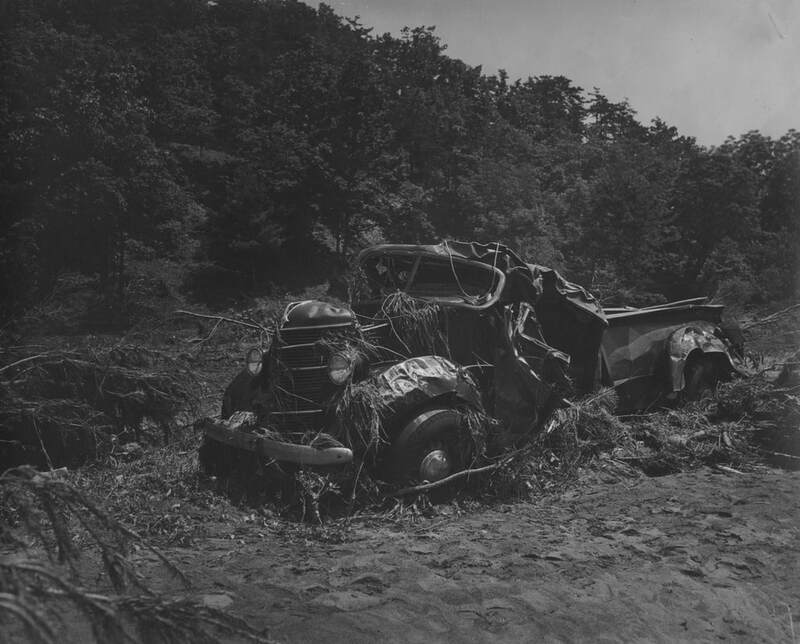 Still, the rain that came down between June 17-18, 1949 caused intense and widespread damage. The cloudburst that centered on Little River and Briery Branch and subsequent flooding came severely and unexpectedly for Shenandoah Mountain communities from Stokesville downstream to Bridgewater. During the first day of the flood, a cloudburst rained an estimated 15 inches, and over the course of three days, 20 inches of rain had pummeled the localities. The power of this quantity of water caused landslides, destroyed homes, swept livestock away, and took human lives. But in the aftermath of the Flood of 1949, residents banded together to rebuild the homes and businesses of their heritage. Jake Cramer house after the flood. Photo from Alan Cramer collection. ​After the Flood of 1949, one family was left with next to nothing but their loved ones and a refrigerator. 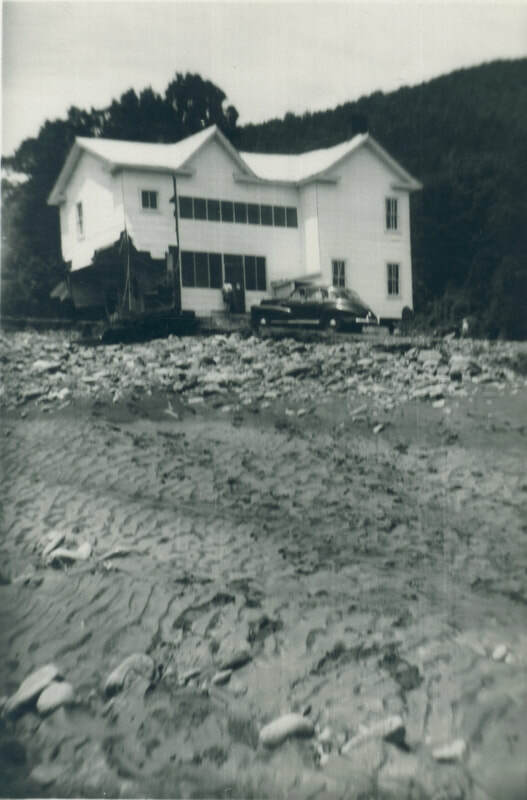 Immediately after the massive flood, the Cramers decided to relocate their family home to the hill above the floodplain. Alan’s great Aunt Lizzie, who filled the role of his grandmother, housed the family during construction. Resourcefully and efficiently, the Cramers used stone unearthed by the storm and had their new house completed by 1950. 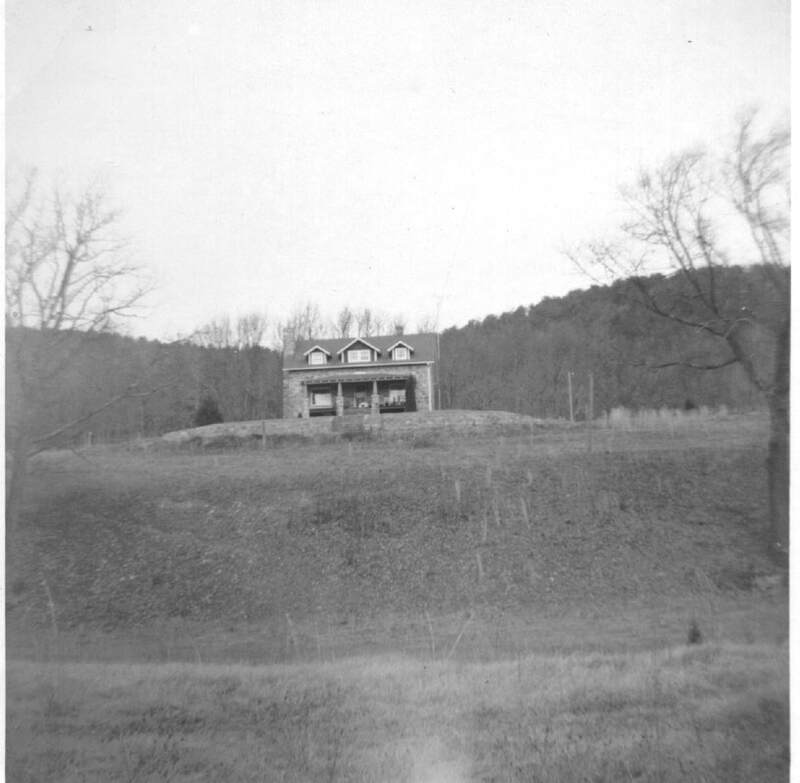 The Alan Cramer family still occupies this family home, which sits at the edge of North River Gap just outside of the George Washington National Forest (GWNF). Despite widespread displacement and property destruction, Stokesville fortunately lost no lives in the Flood of 1949. Community members worked together to survive the storm. Those stranded on farms and in communities without road access received air-dropped food. Alan Cramer’s father was instructed to evacuate workers and their families in a lumber truck. He drove the truck over the Stokesville bridge, and its occupants watched in safety as the river rose higher and higher. Some were evacuated by horses. The day after the flood, a horse named Nellie hauled some 150 people across the raging North River near Mt. Solon until her feet were so sore she could do no more. Four fresh horses continued the job. Despite rescue efforts, three lives were lost in the community of Bridgewater. Two belonged to a mother and daughter of the Bricker family. 12-year-old Betty Bricker outlived her mother and sister by climbing a tree half a mile from where the waters swept her away and hanging on to its branches for hours until two citizens rescued her at daybreak. Searchers did not find the bodies of Mrs. Margaret Bricker and 9-year-old Frances Bricker until one week after the flood. The third life lost belonged to Mrs. C.R. Bowman. The Flood of 1949 left the area with $2,000,000 in damages, according to a USGS survey, and relief and rebuilding necessitated all hands on deck. The American Red Cross and Salvation Army provided disaster relief in Stokesville. Floodwaters had miraculously parted at Stokesville Church, leaving it one of the few structures standing. Response volunteers based relief efforts in this place of worship. Harrisonburg firemen, state police, members of the American Legion, Veterans of Foreign Wars, and the National Guard also responded to the flood in nearby localities. 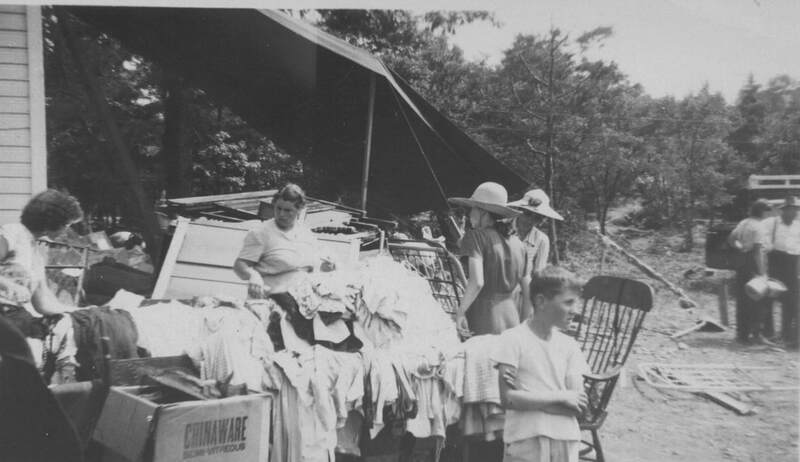 In Bridgewater, the men’s dormitory at Bridgewater College became a temporary home for volunteers and displaced families. Even with the temporary help of these outside bodies, long-term reparations mostly fell into the hands of the natives who sheltered and uplifted one another. In tight-knit communities, reliance on neighbors and family serves as the most important form of insurance. Alan Cramer spoke of his Aunt Lizzie, who provided shelter for Boxie Lloyd, his wife, and their six children in a boarding house she called “The Cottage” for months as they worked to build a new home. Cramer, Alan. Personal interview. 2 Mar. 2018. "Flood's Aftermath Pitiful Sight, Leader Writer Says Following Tour of the Area." Staunton News Leader. 21 Jun. 1949. Harter, Dale. “The Flood of 1949 in Bridgewater." Harrisonburg-Rockingham Historical Society Newsletter (Summer 2008): 1, 4-5. “High Waters on Rampage in Nearby Counties; Heavy Rains in Highland.” Highland Recorder [Monterey, VA]. 24 Jun. 1949. Mussey, Orville D. Flood of June 1949 in the Stokesville-Bridgewater Area. Virginia Department of Conservation and Development in cooperation with the U.S Geological Survey. 1950.